MSV: So what's next for Hoboken? Hoboken finally can marshall its resources to move forward and see real progress after this decisive November election. What's in store for the City and on the City Council. Last night provided some clues. 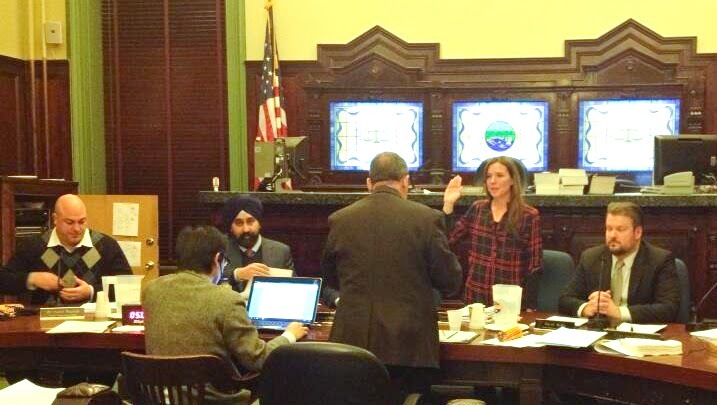 Councilwoman Jen Giattino is sworn in last night becoming the Hoboken City Council President. She'll be up to the job with Vice President Ravi Bhalla (l) at her side. What's next for Hoboken? Council Vice President Ravi Bhalla was elected from the City Council to the board. Talking Ed Note: Congratulations to them all - Hoboken is now really moving.